Before any angry fingers dart toward keyboards to stab out rebuttals, be advised that at no point in this writing will the argument be made that Zack Snyder’s 2004 remake of George A. Romero’s monumental 1978 classic Dawn of the Dead is in any way superior to its source material. Romero’s original is a bloody, angry, unforgettable social allegory tucked inside a lively adventure film—a celluloid cri de coeur hasn’t dimmed in volume on the way up to its fortieth anniversary, as Chris Alexander passionately wrote in a very personal essay earlier this week, and the waves of Dawn’s resonance can still be felt today in every corner of pop culture and serious film study. It’s this beatification of the original Dawn that drowns out any deeper examination of the merits found in the remake, and there are indeed many. 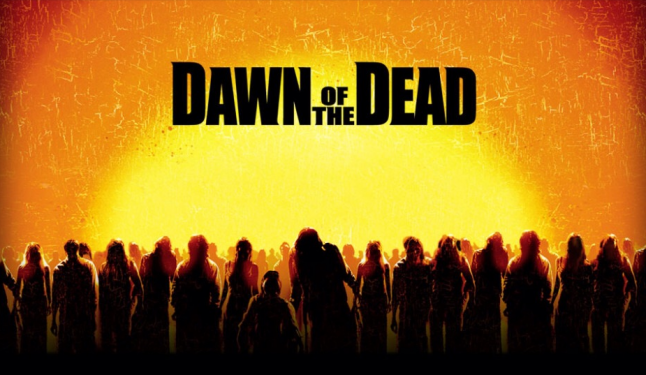 Dawn 04 is generally acknowledged to be a high point of the remake wave that washed over horror fans during the previous decade, though often waved off as a dumber, louder kid brother compared to Dawn 78; it’s frequently dismissed as “a pretty good action movie” before talk goes back to the enduring greatness of Romero’s version. In this, genuine consideration of Dawn 04 as it stands on its own is often overlooked, and it’s better late than never to address this mistake. That opening sequence. Dawn 04 sports one of the meanest, most kinetic kickoffs in horror, with Snyder announcing himself to filmgoers in the form of a suburban summer idyll shattered by a flailing, gnashing, monster-child pelting itself against shellshocked nurse Anna (Sarah Polley). Dawn 78 eased the audience gradually into the chaos of a zombie takeover, assuming that Johnny and Barbara’s graveyard surprise in NOTLD sufficiently startled audiences. Dawn 78’s newscasters and were police aware of the zombie mission statement from the jump—there was no such briefing provided for poor Anna, and the adrenalized zombie assault that she endures before the credits even kick in serves as one hell of a fierce reintroduction. Anna meets up with Officer Kenneth (an imperious Ving Rhames, never better) and they proceed to sequester themselves in a Milwaukee mall with a number of other survivors in hopes that a rescue will arrive. For those unaware of her day gig, Polley is a child actor-turned-writer/director involved most often with talky, serious-minded arthouse fare. Her Canadian citizenship made her attractive to Dawn 04’s Toronto production in terms of meeting government-mandated casting quotas, and Polley said at the time she was thrilled with the chance to take a departure and topline a more action-oriented project. The Dawn of the Dead remake thus landed a tremendous, highly-experienced actress to fill the customary horror heroine uniform of blood-spattered white tank top; Polley’s face fresher than her remake contemporaries in that she didn’t graduate to a feature film lead through putting in time on teen television melodramas, or feel that she was slumming it by doing horror and then letting that attitude to seep through in her performance (yes, that was a dig at the Nightmare on Elm Street remake’s Rooney Mara). Rhames is excellent as the bruising, insensitive cop best suited to battle the new world disorder that humanity now faces, while Mekhi Phifer and everyman Jake Weber round out the remainder of the uninfected. The central message that recurs throughout Romero’s Dead films is how humankind is prone to destroy itself through petty squabbling while larger threats are ignored. Dawn 04 is actually a more hopeful take on the zombie apocalypse, with the disparate group of survivors drawn from opposing backgrounds and social classes sorting their differences and uniting in a common cause (namely, a third-act dash out of their gilded prison with their flesh intact, one that ultimately proves to be in vain). The updated script for Dawn 04 comes from one James Gunn, today beloved in horror fandom for his film Slither and by the remainder of the moviegoing world for the all-conquering Guardians of the Galaxy. In 2004, Gunn was only notable for his weirdo Troma output and for writing the Scooby-Doo movie, but his Dawn screenplay has that unique balance of comedic dialogue and serious moments that he is now known to pen so deftly (though apparently there were a number of major changes from Gunn’s script through to Snyder’s final version). Gunn’s comedic beats are never handled with more aplomb than when a then-unknown Ty Burrell arrives late in the game as alpha-jerk Steve, and he outright steals the movie with his snarky line reads and precise comic timing. The oft-mentioned action scenes are what seems to be the aspect most viewers take away from of Dawn 04, and with good reason: Snyder may now have gotten himself snarled up in the brambles of megabudget superhero behemoths and diluted filmmaking-by-committee, but Dawn 04 and his subsequent hit 300 once had him pegged as one of Hollywood most promising young talents. His sprinting, spasmodic corpses here are not of the classical zombie canon, true, but they make for an undeniably urgent menace. (Running zombies work for the context of this movie, while walking zombies better serve the purpose of other movies and shows. The superiority of one zombie interpretation over the other was a pointless debate then, and it remains so now.) Guns roaring in slow motion, chainsaw blades whirring and stabbing, the veering into full-on Mad Max territory with tricked out shuttle buses, and pure grossout gags like the undead birth scene or the obese zombie death hag are all thrilling to watch—editor Niven Howie deserves a chunk of credit here, as even the character moments in Dawn 04 are cut together tightly. 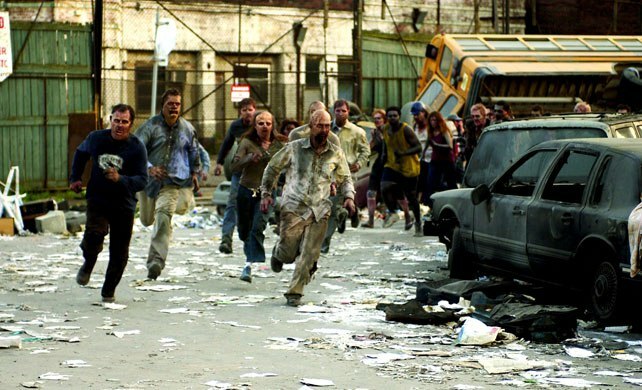 It’s a bit of a tragedy that Snyder’s proposed follow up film War of the Dead, which was to feature zombie battles on a grand, citywide scale, never came to fruition. Dawn 04 has a tiny budget compared to, say, Batman v Superman, but Snyder lays in stock footage from various scenes of global upheaval and some clever greenscreen trickery to really have his Zombie apocalypse feeling like massive, worldwide pandemonium. This film also marks Snyder’s first collaboration with composer and current Marilyn Manson guitarist Tyler Bates, whose percussive and grindingly discordant synth score for Dawn 04 really set the template for horror music of the double-O-decade. The wonky 2004 computer effects stamp a date on Dawn 04, especially in the smeary zombie crowd scenes, but the core ideas remain intact. The Dawn of the Dead remake frames those ideas in a modern context, but adjusts the weights—the vaunted anti-consumerism is here, but greater emphasis is placed on the basic subtext. In this, Dawn 04 has as much in common with the fifth tale in Romero’s Creepshow (‘They’re Creeping Up On You’) as it does with the original Dawn. While more shopping malls and physical storefronts shutter up daily, as the act of mindless consumption joins social interaction as a mostly online pursuit, Dawn 04’s thematic read of the very few versus the very many, of outsiders scratching to get their share, will never cease to resonate. Shots of the survivors on the rooftop with rifles, the bourgeoisie surveying the hungry rabble below from the tenuous safety of their high parapets, can be taken as the privileged of today sitting in gated, guarded communities and going about their daily activities while hoping to somehow forget that they are ever surrounded and outnumbered. 2004, just as 1978, was an era of exceptional fear and tumult, but the notion of wealth disparity and class warfare never ebbs from year to year and today it seems timelier than ever. Dawn of the Dead 2004 still packs a potent bite in its own right and deserves a serious second look.